Taken together, the coalface testimony of these two enterprise cloud pioneers provides the evidence I’d been waiting for to declare private cloud comprehensively discredited â not only economically but now also strategically. There will still be plenty of private cloud about, but no one will be boasting about it any more. In a nutshell, an enterprise that builds a private cloud will spend more, achieve less and increase its risk exposure, while progressing no further along the path towards building a cloud applications infrastructure. 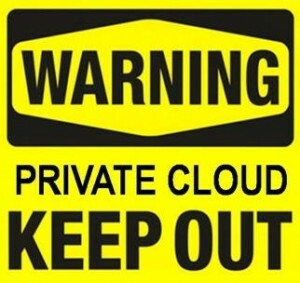 It’s a damning indictment of the private cloud model from two CIOs who have practical, hands-on experience that informs what they’re saying. Their message is that private cloud is a diversion and a distraction from the task of embracing cloud computing in the enterprise. It can only make sense as a temporary staging post in the context of a systematically planned transition to public cloud infrastructure.